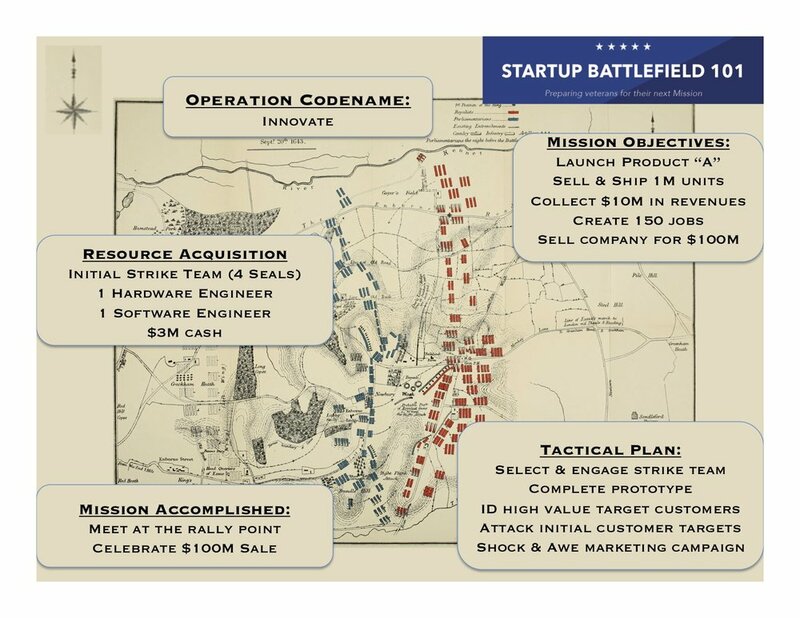 Innovation Battlefield 101 is designed to provide veterans & their families with the skills and tools needed to leverage their leadership experience into a successful career in the private sector. The course begins by introducing you to the landscape of innovative startups as a simulated battlefield. Course Overview approx 8 minutes. Innovation Battlefield is designed to provide veterans & their families with the skills & tools needed to leverage existing leadership experience into a successful career in the private sector. The course begins by introducing you to the landscape of innovative startups as a simulated battlefield. The world of entrepreneurship and innovation is mapped out as an important mission with allies, enemies, strategic assets & tactical plans of attack. We walk through case studies making direct comparisons between military missions & entrepreneurial missions. Participants quickly learn the language and the landscape of their next battlefield environment, which engages their well-honed instincts on how to best accomplish the mission. Military leaders are highly skilled and experienced at planning complex missions in dynamic & hostile environments. Repeatable methodologies are tested repeatedly over many years and these tried & true methods produce the most effective and efficient means available for planning aggressive missions that intend to expand rapidly if needed. Mission Readiness & training are part of everyday life in the military, and their operating environment is not unlike that of an entrepreneur. Join us as we journey into the world of Operation “Innovate”….. The business mission for a newly established company is presented as just another mission with clear objectives, resource acquisition, strategies & tactics and mission clarity. © 2018 SmartMoney Veterans, LLC. All Rights Reserved.